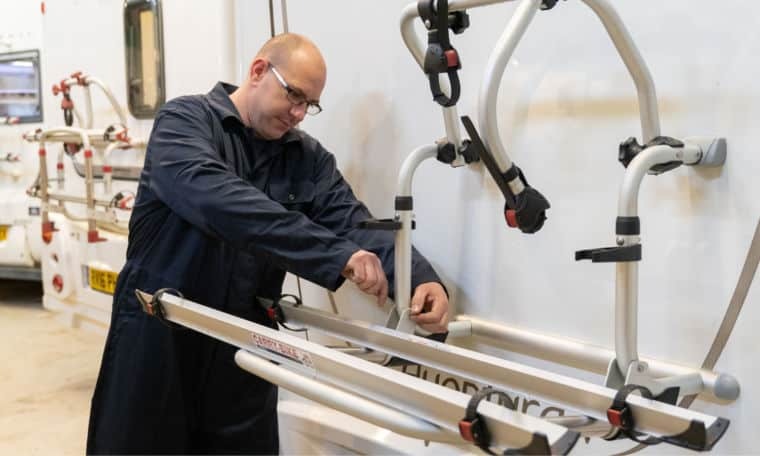 With us you’ll have the peace of mind of knowing that our dedicated on-site service centre is part of the Approved Workshop Scheme (AWS), run by the NCC. At Webbs we are proud to be a Camping and Caravanning Club Preferred Dealer for sales, servicing and repairs. Our friendly and experienced service team are here to ensuring your warranty remains protected and your legal obligation to keep your vehicle roadworthy is met..
Our Webbs mechanics and technicians are qualified to the highest standard and are superbly knowledgeable about all makes and models. Please be aware our Service Centre can get extremely busy, particularly in the build-up to peak holiday periods. To ensure your vehicle is ready for action when you need it, we advise that you book your service as far in advance as possible.